Students select an essay topic from among six options. 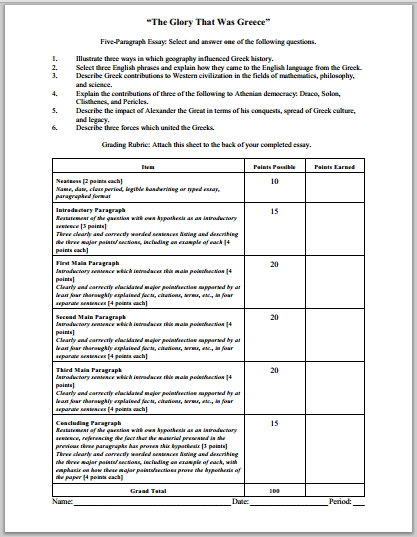 The grading rubric is laid out, allowing students to know precisely what is required, while also providing teachers with a convenient grading sheet. Five-Paragraph Essay: Select and answer one of the following questions. 1. Illustrate three ways in which geography influenced Greek history. 2. Select three English phrases and explain how they came to the English language from the Greek. 3. Describe Greek contributions to Western civilization in the fields of mathematics, philosophy, and science. 4. Explain the contributions of three of the following to Athenian democracy: Draco, Solon, Clisthenes, and Pericles. 5. Describe the impact of Alexander the Great in terms of his conquests, spread of Greek culture, and legacy. 6. Describe three forces which united the Greeks. 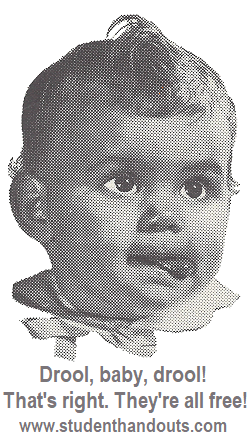 Click here to print this sheet. For our printable five-paragraph essay organizer, click here.